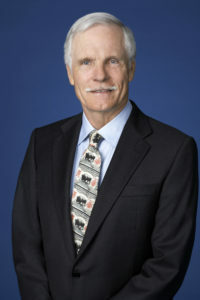 Throughout his career, Robert Edward “Ted” Turner has received recognition for his entrepreneurial acumen, sharp business skills, leadership qualities and his unprecedented philanthropy. He has stepped into the international spotlight with one accomplishment after another. Whether in billboard advertisement, cable television, sports team ownership, sailing, environmental initiatives or philanthropy–Turner’s vision, determination, generosity and forthrightness have consistently given the world reason to take notice. Turner began his career as an account executive with Turner Advertising Company and entered the television business in 1970 when he acquired Atlanta independent UHF station Channel 17. In 1976, he purchased Major League Baseball’s Atlanta Braves and launched TBS Superstation, originating the “superstation” concept. The following year, Turner Broadcasting acquired the National Basketball Association’s Atlanta Hawks, and in 1980 launched CNN, the world’s first live, 24-hour global news network. Over the next two decades, the company built a portfolio of unrivaled cable television news and entertainment brands and businesses. Turner has also made his mark as one of the most influential philanthropists in the U.S. He is chairman of the Turner Foundation, Inc., which supports efforts for improving air and water quality, developing a sustainable energy future, safeguarding environmental health, maintaining wildlife habitat protection, and developing practices and policies to curb population growth rates; cochairman of the Nuclear Threat Initiative, which works to reduce the threat from nuclear, chemical and biological weapons; and chairman of the United Nations Foundation, which promotes a more peaceful, prosperous and just world. He also created the Captain Planet Foundation to help educate children about environmental issues. He is chairman of Turner Enterprises, Inc., which manages his business interests, land holdings and investments, including the oversight of two million acres in 12 states and in Argentina, and more than 50,000 bison head. Along with his partner Longhorn Steakhouse founder George McKerrow, Turner launched the Ted’s Montana Grill chain, which operated more than 55 restaurants nationwide.